H:SA might be full of Halo story and characters, it might have a few good ideas here and there, but it's not a good game. I've had a frustrating experience with bad mission design, innapropriate gameplay systems and weird AI that made me stop playing way before the end of the game. I love twin stick shooters, but certain kind of challenges are left to other genres of videogames. Let's start with the good parts; I love the skull system - modifiers you add to make the mission more difficult while getting more experience from it. I love the medals that you get for completing mini-achievements during the missions. I'm not Halo Expert, but I think they've recreated the halo weapons, enemies and systems - shields, grenades, etc - as I remember like they were when I played Halo 1. The missions are mostly badly designed. After a few simple missions of 'killing enemies' or 'destroying turrets' that I felt were at the right place for that kind of game, it threw me something about surviving for set time period while waiting for a vehicle to come pick me up. 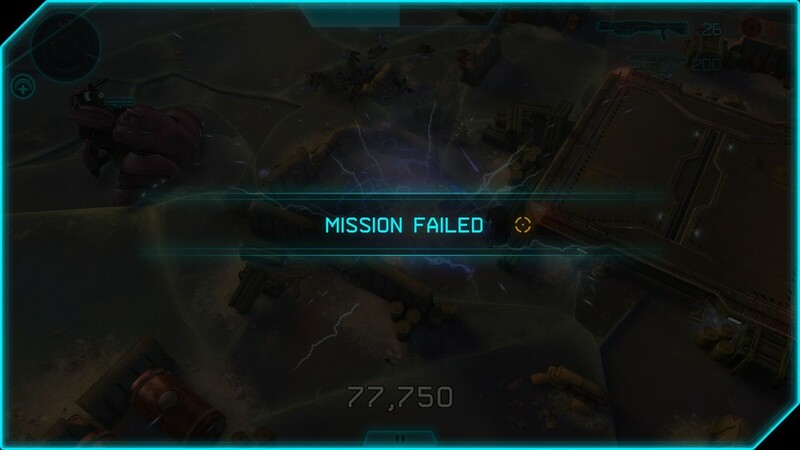 The timed survival part was fine, what I found dumb is not finding how to get into the vehicle - there weren't any prompts or obvious glowing spots to walk to - and then failing the mission, only to be prompted to start over the whole thing. Another mission had me protect vehicles against enemy fire with my AI dudes fumbling around, getting crushed by the caravan they had to protect and a message warning me that they were taking fire, only for me to patrol all around them and find nothing. The last mission I did was about protecting a wall that was attacked by kamikaze enemies. I did the best I could, but it didn't take long for the wall to simply get blown up by the seemingly endless wave of enemies. And I didn't want to start over that. I'm also not a fan of spending experience points to unlock temporary better weapons or perks. Don't call them experience points if they're not used to level-up and improve your character - and for such a game as H:SP, there would be plenty of ways to boost permanently your guy, more shield, more ammo capacity on weapons, etc. - if you want it to be a one-shot resource that you deplete, make it money rather than experience. I never bought anything because it's all temporary and you never know when you'd actually need to. Finally, the basic controls are fine, moving with the keyboard and shooting with the mouse works fairly well. I've been confused a bit between all the other buttons - switch weapon, interact, switch grenade, use special skills - on my keyboard, but it wasn't too bad. For all the things I didn't like about H:SA, the control scheme was fine. That being said, switching to a non-emtpy gun when you're out of ammo would've been a nice thing to do.